Is your daughter graduating high school this year or within the next couple of years? 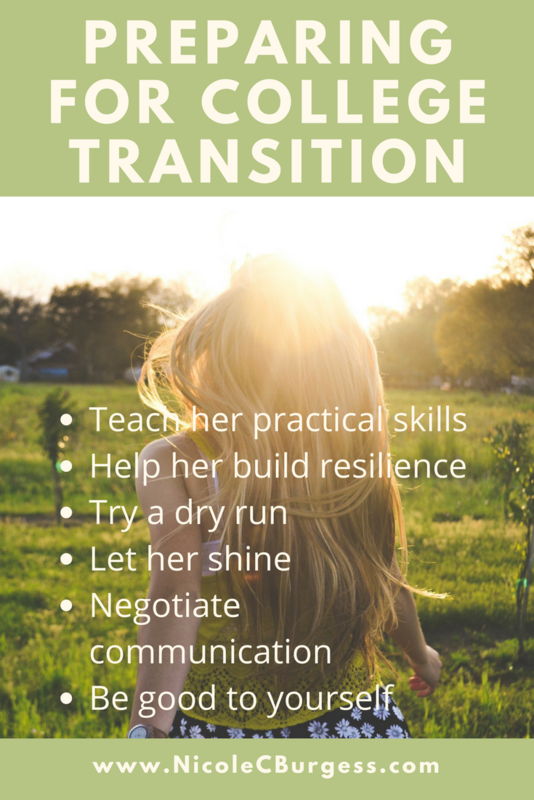 Here are some steps to prepare her for a successful launch and for you to practice self-care. You’ll feel a lot more confident sending your daughter off to college when you know she knows how to do laundry, budget for expenses, balance a checkbook, manage her time well, get the right help in an emergency and other basic life skills. Kids who struggle most are the ones whose parents always managed everything for them. Letting her figure out how to solve little problems, like missing the bus, helps build her self-confidence. Teaching her how to cope with small failures, disappoint and losses can give her a stronger foundation for rebounding from the larger hurts that life might throw at her. Whether it’s a youth group camp-out or a week long class trip, short periods of independence can help both of you prepare for the day when you drop her off for her first semester. When you drop her off, remember that it is her moment, her new beginning. Be honest about how much you’ll miss her, but don’t burden her with your anxiety. Remember that your need to be needed should take a back seat to her need to grow into her independence. You and your daughter might want to agree on how often you should call or text. You’ll want to balance being available if she needs you with giving her the privacy she needs to shape her new life. Plan something fun for the day after you drop her off, so the house seems less lonely. Going forward, take the time to get back in touch with your dreams, dive into your hobbies, reconnect with friends you haven’t seen recently and enjoy some quality time with your partner. Be confident that you raised your daughter to handle the college transition, and that you’ve prepared yourself, as well. Nicole Burgess LMFT works with teen girls and women in overcoming anxiety, perfectionism and rediscovering joy. She offers both office and online therapy sessions for Indiana and California residents.